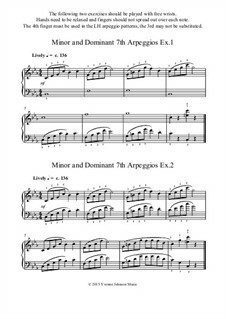 2 lively exercises using Cm7, Fm7 and G7 chord patterns to help students become comfortable with using the 4th finger in LH arpeggios and develop an easy, free arpeggio technique. Students play each hand separately in Ex1, then together in Ex2 with a slight variation at the end. Both exercises have a Tierce De Picardie in the RH final chord. Suitable for grade 2/3 piano students.